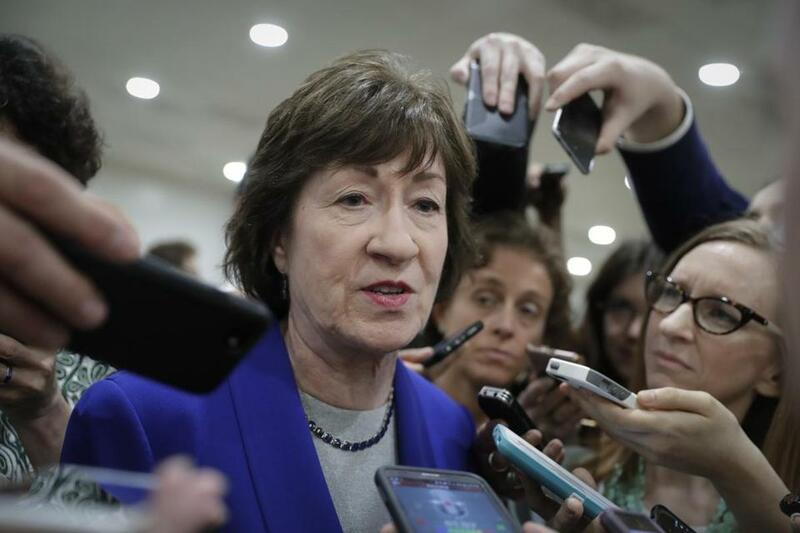 Susan Collins, Republican senator from Maine, spoke to reporters Thursday. A key moderate Republican senator said Sunday she’s waiting for a Congressional Budget Office score to finalize her position on the Senate bill to repeal and replace Obamacare and that she has concerns about the measure’s impact on older and rural Americans. ‘‘I have very serious concerns about the bill,’’ Sen. Susan Collins of Maine said on ABC’s ‘‘This Week.’’ The CBO score ‘‘will be so important,’’ she said. Senate Republican leader Mitch McConnell on Thursday unveiled a long-awaited proposal to replace the health-care reforms enacted by President Barack Obama. The draft bill would cut Medicaid for the poor and disabled by some $800 billion and scale back subsidies designed to help people afford coverage. The plan also would provide an additional $50 billion over four years to stabilize insurance exchanges. Collins said she’s ‘‘very concerned’’ about cuts for older people with serious, chronic illnesses and the impact on lower-income Americans, as well as the cuts to funding for rural hospitals and nursing homes through Medicaid reductions. ‘‘Based on what I’ve seen, given the inflation rate that would be applied in the outer years to the Medicaid program, the Senate bill is going to have more impact on the Medicaid program than even the House bill,’’ she said. Seven or eight Republican senators have been meeting under the leadership of Rob Portman of Ohio to express concern about Medicaid, Collins added. Moderate senators in the Republican party are worried the GOP bill may endanger Medicaid funding in their states. Also on ABC, Kellyanne Conway, an adviser to President Donald Trump, said the reduction in Medicaid funding wasn’t a ‘‘cut’’ but an assumption of a slower rate of growth in future. 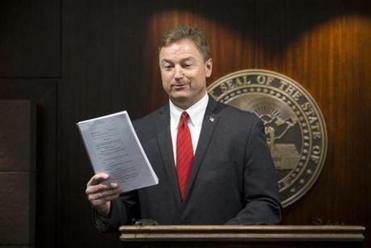 Only a few hours after the bill was released, four conservative senators led by Rand Paul of Kentucky announced that they’ll need a host of changes to get to ‘‘yes.’’ On Friday, Dean Heller of Nevada added his name to the dissenters, saying the plan would take away insurance from too many people in his state. Paul said on ABC that the Republicans ‘‘promised too much’’ and that ‘‘there’s no way the Republican bill brings down premiums.’’ He said if McConnell can’t get the required votes to pass the bill, he could support an effort that focuses on repealing Obamacare. McConnell has said he wants the chamber to vote on the measure this week, after an open-amendment process. Lawmakers leave town the following week for an Independence Day recess, but even some Republicans are urging him to slow down. Sen. Ron Johnson of Wisconsin, part of the faction that thinks the bill doesn’t go far enough in rolling back Obamacare, said he’d like to delay a vote. Chuck Schumer, the Senate Democratic leader, said the Republican bill has ‘‘at best a 50-50 chance’’ of passing in its current form. ‘The bill is just devastating. And that’s what’s making it so hard for them to pass it,’’ Schumer said on ABC. The views of Senate’s conservative anti-Obamacare faction were echoed on Saturday by leaders of the influential Koch political network. ‘‘We’ve been disappointed that movement has not been more dramatic toward a full repeal or a broader rollback of this law, Obamacare,’’ Tim Phillips, the president of the Koch-affiliated political advocacy group, Americans for Prosperity, told reporters at a donor retreat in Colorado. The CBO is expected to release its estimate of the bill’s impact in the next few days. That’s being watched to see how it compares with the House bill, passed in May, which the non-partisan office estimated would see some 23 million Americans lose health insurance over the next decade. Trump on Saturday started to pressure the handful of potential Republican senators who may be planning to vote against the measure. ‘‘I cannot imagine that these very fine Republican Senators would allow the American people to suffer a broken ObamaCare any longer!’’ Trump said on Twitter. Conway said the president has been working the phones and having personal meetings with lawmakers to help promote the bill. Still, in an interview with ‘‘Fox and Friends’’ broadcast on Sunday, Trump admitted for the first time that he’d called the House health bill ‘‘mean,’’ despite celebrating its passage in a jubilant ceremony in the White House Rose Garden. Despite the opposition within his own party, McConnell may have some tricks up his sleeve. The veteran Senate tactician may have made some intentional omissions in the ‘‘discussion draft’’ he released on June 22, so that other lawmakers can be seen to secure public victories in return for their support. In that vein, Sen. Bill Cassidy, R-La., said Sunday on CBS’ ‘‘Face the Nation’’ that while he’s undecided on the bill, he’s open to a ‘‘yes’’ vote if certain elements that affect his state can be addressed. ‘‘I frankly would like more days to consider this,’’ he said.